At the end of the eighteenth century, the roads of Watford were a bad state of repair. An alternative route had to be found for the transportation of heavy goods. Around 1793 the building of the Grand Junction Canal began in earnest, to connect London with the Midlands. Built by hand, it was fully open by 1805 and all the trade of the country began to travel along it. The speed limit was set at 4 mph. Flowing through both Cassiobury and Grove estates, in 1819 the canal was eventually seen as a complement to the countryside. By 1860 a regular service of steam narrowboats ran both day and night. The journey from Watford to London took around a day and trade was varied, the biggest single item being carried was coal. Steady growth in London encouraged an important trade in house-building materials. 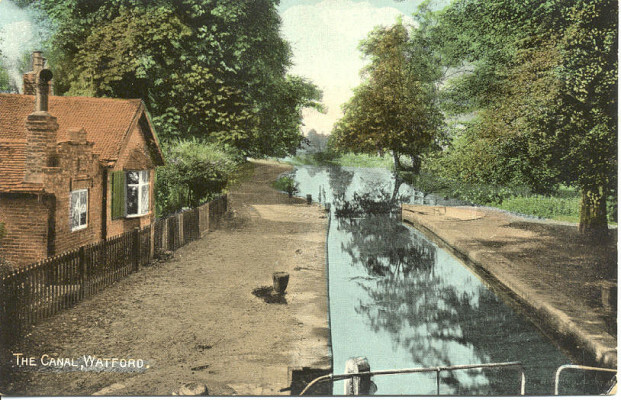 Like the stage coaches, the canal suffered with the coming of the railway to Watford.